Welcome back… it’s great to ‘see’ you again! Pull up a chair, grab some coffee and sit a spell. 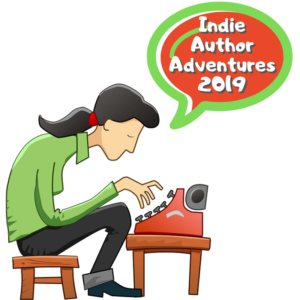 For you just joining, each week in 2019 I’ll be sharing my adventures in indie-authoring, what works, what doesn’t, and what I’m learning along the way. Unfiltered, unscripted, but hopefully helpful to some other indie-authors out there working on climbing their own mountains. Other than fighting through writing withdrawal (yeah, it’s a real thing lol! ), I am mostly okay with that because I realize that it is all about the counter-balancing between my author-writing career, and my author-tech career. What is counter-balancing? Check out my week six adventure to learn more. However, I do want to talk about something in that same arena… and that’s boundaries and learning “No”. Phew… “No” is a tough one for me. As someone who is naturally inclined to help others, and part of my long-term goals has always been to be of service to other indie-authors, “No” becomes even more difficult. BUT – “no” is the best tried-and-true method of protecting your own time and sanity, and to be able to take care of yourself and your own goals. Many writers, especially indie’s, and especially early in their careers can’t write exclusively. They still need to pay the bills, so most have their “day job”, or like me have another business they run. I am blessed in that I started directing my tech biz to fall into the indie-author community rather than the world at large — so even my non-writing work is still related to this indie-author community that I love. But those things – the day job, the life responsibilities – all of those things, are exactly WHY we need to learn to not only say “no”, but to embrace it and learn to love it for what it is… a form of true self-care and self-respect. Yes, your (my) heart may be in the right place by wanting to help everyone, but at the end of the day that simply isn’t achievable — and it is definitely not sustainable. If you have something that you dream to do, long to do, can’t stop thinking about the doing of it… in this case, the dream of being a “successful” (whatever success means to you) indie-author… then you owe it to yourself to protect that dream, to nurture that dream, and to GIVE YOURSELF PERMISSION AND TIME to follow and achieve that dream. The only way to do that – learn to say no. Say no to those things that are not in alignment with your priorities and your goals. But – come on, that’s easier said than done… how do you learn to actually do that in the real world? It’s not easy… but it is simple. Necessary — is it necessary, required, a life thing that must be done? Some things in life have to be done even if they aren’t in 100% alignment with our dreams, goals, and priorities – think ‘day job’ for example. You may hate your current job, and are *only* there because you have to pay the bills – and that is okay! There is NOTHING wrong with having a “bridge job” — a job that bridges you to the next place / next job which is putting you closer to you goals. Laundry / doing dishes – nope, not in alignment with my goals / priorities LOL – but, they kinda are. My biggest priority is my son / family. As much as I dislike ‘wasting’ time cleaning that I could be writing or working, those are necessary things that need to be done, and are done in support of my biggest priority: my family. Also – keep in mind, self-care is necessary. It is not a “frivolous” thing. Ordered — does it fall into the natural order of my priorities and goals? Is the thing I’m getting ready to do right now supporting my priorities? Is the thing I’m getting ready to AGREE TO DO supporting or furthering my dreams and goals? 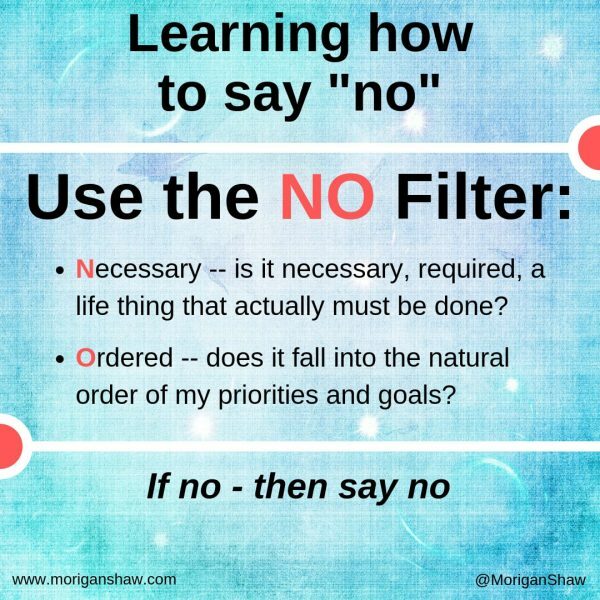 NO – if it is not Necessary and it does not fall into the Order of my priorities and dreams… then it is a no. Here’s the caveat: you have to respect yourself enough to give yourself permission to say no. Ooooh, that’s a tough one. And, it’s one that only you can do. That is an inside job, no one can give you that permission or self-respect but you. And this doesn’t just apply to protecting your writing time. This can be applied to every area of your life. Look at the huge, possibly greasy, (but delicious) meal you are getting ready to inhale… is it Necessary? Is it in Order with your priorities, dreams, and goal? Is there a different meal you could eat that would serve your priorities and goals better? There’s a power that comes from beginning to live consciously and filtering the things you do with your day through your own NO filter. Give it a try – even for just a couple weeks… you may be surprised at what you learn about yourself. 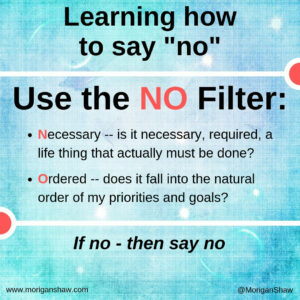 Some people may see the Filter of NO as “something else they have to remember to do“… but in actuality it can greatly simplify your life. And let’s face it – all of our lives have gotten way too hectic, busy, and overwhelming at times… if you can use such a simple tool to help ease that – isn’t it worth a try?